Bookanakere Siddalingappa Yeddyurappa or BSY is the 23rd Chief Minister of Karnataka. He was the first Bharatiya Janata Party Chief Minister for any Southern state in India. He was despite bringing fame to BJP, evicted from the party due to allegations that are debatable. He was succeeded in the Chief Minister’s office by the President’s rule and then he returned to power to give it to D.V. Sadananda Gowda. Born in February 1943 in a small village called Bookanakere in Mandya, BSY had humble beginnings. He was raised by his father after his mother passed away when he was only four years old. His education halted after completing pre-university from PES College in Mandya. In 1965, he took up a job as a first- division clerk in the state government wing of Social Welfare. The job did not satisfy Yeddyurappa and he quit to look for greener pastures. After quitting the job, destiny brought him to Shikaripura where he was to meet his future wife. He had a job as a clerk in Veerabhadra Shastri’s rice mill. Luck had it that he would fall in love and marry the rice mill owner’s daughter in 1967. He later owned a hardware store in Shimoga. This was however not his ambition. Yeddyurappa’s wife passed away in 2004 leaving behind 2 sons and 3 daughters. BSY was involved extensively with the RSS or Rashtriya Swayamsevak Sangh as a young man in college. The RSS had a Shikaripura unit for which he was made the President in the year 1970. His President post was the first step in reaching the Chief Ministers office much later in his life. Owing to his success as president, he stood for elections to the Shikaripura town municipality. He was elected to the post of President of the Jana Sangha at Shikaripura. He was also elected as the President of the Shikaripura town municipality. Like many other politicians, he was arrested during the period of Emergency in India. In 1980, the enthusiasm and political ambition were recognized as he was made the president of the Bharatiya Janata Party unit in Shikaripura. In 1985 he was the President of the Shimoga unit of Bharatiya Janata Party. From there, his Presidentship sailed to Karnataka. In 1988 he was the President of the Bharatiya Janata Party Karnataka. 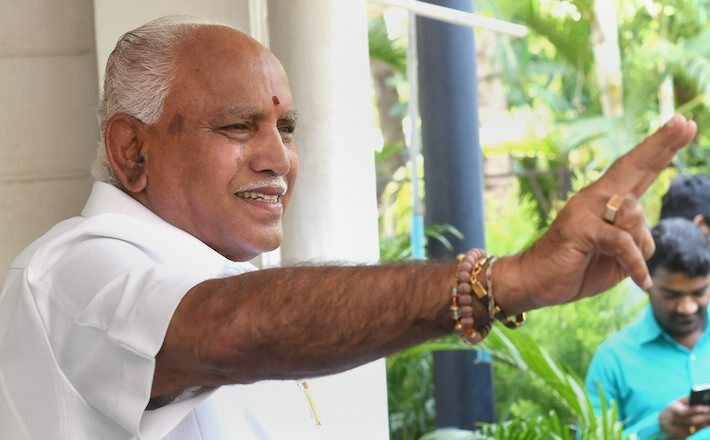 Besides his role as president to Bharatiya Janata Party, BSY was also elected to the lower house of the Karnataka Legislature a total of six times, representing the Shikaripura constituency. He was a member of the Karnataka Legislative Assembly through the seventh, thirteenth, eighth, ninth, tenth and twelfth Legislative Assemblies. After the 1994 State Assembly elections, he was nominated for the post of leader of opposition in the Karnataka Legislative Assembly. He was re-elected to the same post after the elections of 2004 when Dharam Singh was the Chief Minister of Karnataka. H D Kumaraswamy had BSY’s support while setting up a coalition government against the government set up by Dharam Singh. According to the agreement between Kumaraswamy and Yeddyurappa’s parties (JDS and BJP), Kumaraswamy was to be in power for the first twenty months and was to relinquish power in favor of BSY for the next twenty months. He was for the time being given the portfolios of Deputy Chief Minister and Finance under the government headed by Kumaraswamy. In 2007, when Kumaraswamy refused to hold up his end of the bargain, Bharatiya Janata Party withdrew their support and a lot of ministers resigned from their posts. The differences between the parties invoked the President’s rule in the state. Resolving their differences, Kumaraswamy stepped aside as per the original plan and BSY stepped up to the role of the 19th Chief Minister of Karnataka. The government dissolved a mere five days after he was sworn in owing to differences in the parties again. In the 2008 Karnataka elections, B. S. Yeddyurappa contested from Shikaripura and won the elections fair and square against a worthy opponent who was backed by Janata Dal Secular and Congress. This was a resplendent win for BJP, a win that was written in the pages of history. Through his role as Chief Minister, Yeddyurappa paved the way for friendly relations with neighboring states. He sought to eliminate differences and initiated dialogue between states. He was through his tenure dedicated to putting the spotlight on Kannada and the life and culture of Kannada through the ages. Developmental advances were initiated during his tenure through schemes like global investors meet in 2011. His role as Chief Minister was however not free of scams, allegations, and scandals. Through the allegations that he had misused power to secure prime real estate in Bangalore, BSY kept his cool. He publicly declared his assets, a move that was not all in his favor as it showed a 500% jump since his pre-Chief Minister days. The allegations and rumors pressured Bharatiya Janata Party to set rules straight and he was forced to resign from his post as Chief Minister in July 2011. After a detailed investigation, in October 2016, the special CBI court in Bengaluru acquitted B.S.Y of all charges. After he broke away from the BJP, Yeddyurappa founded his own political party Karnataka Janata Party (KJP) in 2012. In the 2013 Karnataka Legislative Assembly Elections, he once again contested from Shikaripura and won. The KJP won 7 other seats out of the 203 seats they had contested for in this election. In 2013, BSY pledged the party’s support to the BJP-led National Democratic Alliance. In 2014, the party merged with the BJP. In 2016, Yeddyurappa returned to his role as president to Bharatiya Janata Party, Karnataka. He was the BJP’s candidate for the Chief Minister’s post in the 2018 state assembly elections. The BJP won a total of only 104 seats which was 9 short of the simple majority needed to form a government. However, as the BJP was the party with the single largest vote percentage, the Karnataka governor invited B.S. Yeddyurappa to form the government in the State.